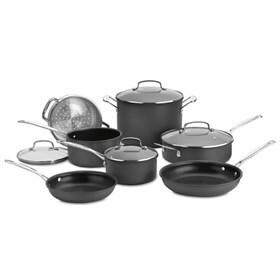 The Cuisinart 66-11 is a 11 piece set cookware which includes all necessary tools to perform any cooking task. The cookware features hard anodized aluminum core construction for fast and even heating. It has solid stainless steel riveted handles which stays cool on the stove-top. The cooking set features Quantanium & nonstick cooking surface which is reinforced with titanium for lasting food release, healthy cooking and easy cleanup. The break-resistant tempered glass lid seals in flavor while keeping the contents visible and a specially designed rim allows for easy drip-free pouring. The 11 Pc. Set Non-Stick Hard Anodized has many exciting features for users of all types. The 11 Pc. Set Non-Stick Hard Anodized is sold as a Brand New Unopened Item.